СПЕКТАКЛЬ ЛЕГЕНДА ДЛЯ ДЕДУШЕК И БАБУШЕК - ТЕАТРАЛЬНЫЙ СЕЗОН В "ЯБЛОНЬКЕ"
ВИДЕО: ДАША И ЕЕ ИСТОРИЯ С "ЯБЛОНЬКОЙ"
КАФЕ "ПАРТИZАН" СОБИРАЕТ ПОЖЕРТВОВАНИЯ ДЛЯ "ЯБЛОНЬКИ"
ИЗ СЕМЯН "ЯБЛОНЬКИ" ВЫРАСТАЕТ ДОБРО - "КАЛИНИНГРАДСКАЯ ПРАВДА"
ПРОВОДЫ ЛЕТА 2013 - "Я БУДУ КОШКОЙ!" Many of you know us as a "Little Apple Tree" (in Russian - "Yablonka"), some of you visited us in Kaliningrad or supported our work financially. For all you have done to keep this Little Apple Tree alive and running we say THANK YOU, FRIENDS! "Yablonka" (in English - ""a little apple tree) was known as a shelter for street children who have no other place to stay, who live on the streets and have no food or any adult care. 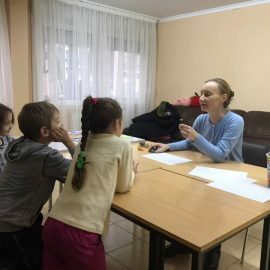 Today, we continue working with these children, but there are other parts of our work - care and social adaptation for children and teenagers with mental and physical disabilities, and targeted support to socially challenged families. 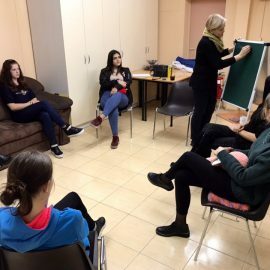 "Yablonka" is THE ONLY shelter for social rehabilitation and adaptation for youth which is not supported financially by the State. Neglected boys and girls in the age of 6 - 18 find at "Yablonka" a place to stay, a bed to sleep in, hot meals, washed clothes and great time to socialise with other children.In 2013 "Yablonka" is turning 18 years old! One of the most interesting times is the summer time, of course. During the summer months we gather many inner-city children, together with them and our children we take trips to the Baltic sea to have a quality time in our Baltic Summer Camp. There are many ways you can help us, and for any kind of a help we say - THANK YOU! We depend on your support. It's just because of your help we can do this work and do it to the full capacity. We hope you will stay in touch and if you don't know us already we will become friends! Let's help the children in the 'Yablonka'!